Why do we eat the type and amount of food we do? What determines our food choices and when we choose to stop eating? There are a number of factors that play a role and now research is looking into the concept of food addiction. 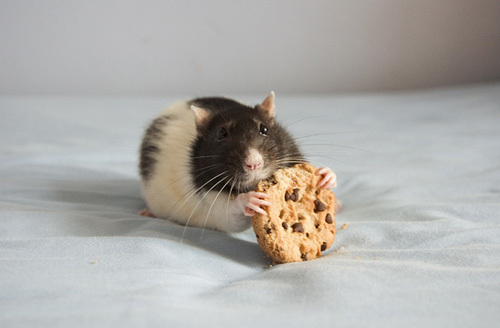 Rats can become addicted to Cookies...can we? There is a growing body of research that indicates people could be addicted to food in the classical definition of addiction. Researchers are showing that rats can become addicted to food and display all the symptoms of irritability, withdrawal and the ability to massively overeat when food is present. This research is giving us the framework to study if some people are also addicted to food. Being addicted to food presents a unique problem as we must continue to eat. You can’t just go off of food cold turkey and never eat again. So how do you overcome an addiction to a something that you need to consume on a daily basis to survive? The first step is to find out if you truly have a food addiction or just tend to overeating at social occasions or when you’re bored. The reason some people overeat is never clear and the potential for true addiction is another factor in a long list of potential problem we need to tackle.